Read This First before you run your Heng Long Tank! Congratulation on buying your Heng Long Tank from Tankzone. If yo haven't bought one yet. This is the right place to start. We test all our tanks before we ship them so you can be sure that your tank will work when it arrives. We also include from time to time, free bonus pack of extra BB pellets, extra bottle of smoking oil or set of AA batteries for the transmitter with all our 1/16 Heng Long Tanks. Those who chose the model with the upgrade metal gearboxes also has the benefit of a higher capacity 2000mAh Ni-Mh 7.2V battery instead of the standard 1700mAh Ni-Cd 7.2V battery. Before you can run your Heng Long Tank, you need to first fully charge the 7.2V rechargeable battery with the basic charger. Both are included with the tank. The charger is 400mA. Therefore for a 1700mAh battery, charge it for just over 4.25 (1700/400) hours for a full charge. For a 2000mAh, charge it for 5 hours. With the Ni-Cd battery, it is best to run it down until it is exhausted before recharging again. Use a discharger if you have one to discharge the battery before recharging. This is to avoid the 'memory effect' where left over charge accumulates to degrade the battery's ability to hold its charge and therefore reduce its lifespan. This does not apply to the Ni-Mh battery, you can top up the charge whenever you like with minimal affect on battery life. The transmitter requires 8 x standard AA batteries. Insert fresh batteries into transmitter. Switch on the unit. The light above the switch should glow red. If no light shows, don't panic. Ensure all batteries have good contact with the terminals by pushing it from the spring end. Don't forget to screw in the transmitter aerial into the top of the transmitter unit. This is important. Without the aerial, the tank would not operate properly and you could damage your tank if it runs off on its own from some stray signal. To ensure that the tank is under control at all times, it is important to switch the transmitter on before the tank. Switch off in the reverse sequence. That is switch off tank first then transmitter. Carefully remove the tank from its packaging. It has been secured by wire and tape to its box to avoid damage during transit. Carefully Insert the fully charged 7.2V stick battery into the battery compartment on the bottom of the tank and connect to terminal inside. It's a tight fit on some models. Replace lid to secure battery. Switch on the tank using the larger switch. The other switch is for the smoke unit. The headlights should flash indicating the tank is on standby mode ready to receive the start command. To start the tank, press the button with the engine icon. This is the leftmost of the three buttons on the bottom of the transmitter. You should hear a whirling sound signifying the engine turning and it will splutter into life. If the smoke unit is switched on, you will also hear a whirling sound from the engine compartment. This is smoke unit pump working. The headlights will flash for a few second then it will stay on. This mean the tank is now ready to receive further commands from the transmitter. If the tank does not start, check to make sure the number of the transmitter crystal (bottom right on the transmitter) is the same as the receiver crystal underneath the tank. The receiver crystal is inside the battery compartment on some models. The smoke unit should already be primed at the factory so you should see smoke coming out of the exhaust after a while once the heating filament has got working. If no smoke comes out after a while, add a few drops of smoke oil into each nozzle. Wait for the heating element to work. You should be able to see the smoke pumping away after a while. You can switch off the smoke generating unit if you wish. The switch is located underneath or on the side of the tank. It is important that you don't keep adding smoke oil into the smoke unit if it doesn't work quickly enough and end up flooding the heating chamber. Once it is flooded, it would take the small heating element a long time to dry it out sufficiently to create smoke again. 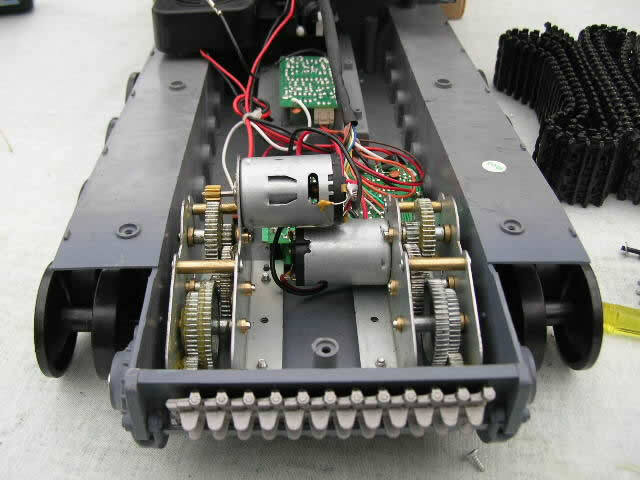 All movement of the tank is controlled by the right joystick. The new smoking and sound version also has proportional control of movement. Unlike the dummy trimmer for the left joystick, the trimmer on the right joystick actually works! Use it to adjust and fine-tune the horizontal and vertical controls. The movement control is fairly obvious and self-explanatory. You will soon get familiar with it and be able to control the tank properly. Push the left joystick left or right to turn the turret left or right. Push the same stick down to raise/lower the main gun. Push the left stick upward to fire the BB gun. More below. All 1/16 Heng Long Tank has an airsoft BB gun built into its turret. There is a safety switch inside the loader's (rectangular) hatch on top of the turret and the BB gun can be switched off if you don't wish this feature to be used. You load the BBs (up to about 40 at a time) through the Commander's hatch on top of the round Cupola for the Tiger 1. It may be different for other models. When the gun is switched on, BB is fired one at a time by pushing the left joystick upward. The gun will keep firing if the left joystick is kept up. A red warning light on the mantlet (front of the turret) glows red just the gun is being fired. The BB Gun should only be used by children under adult supervision, Never aim the gun at any person. It is quite powerful and can cause damage or injury if not use responsibly. Tankzone is not liable for any injuries or damage caused by misuse of the BB gun. Tankzone stock a full range of replacement parts for the Heng Long tank should you wish to attempt your own repair when parts are worn or damaged. 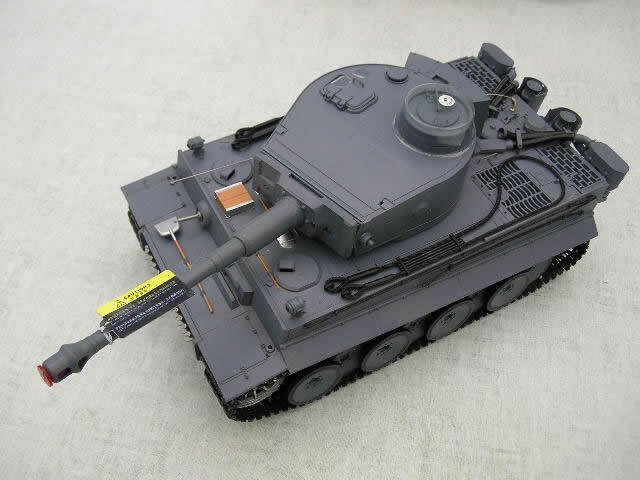 We also stock a wide range of after-market upgrade parts to enable you to customise and create your dream model tank. There are online visual guides and instructions to help you.